Portaluca celebrates Small Business Saturday! Portaluca, which is formerly known as 4th Street Boutique is a great boutiqe that specializes in selling gently used clothing, shoes and accessories for women. This boutique is directly linked to the Dress for Success program in Cincinnati, which services disadvantaged women. The boutique has two locations, one located in Downtown Cincinnati and the other in College Hill. Both locations hope to cater to clients who would like to grab great fashion finds for less. 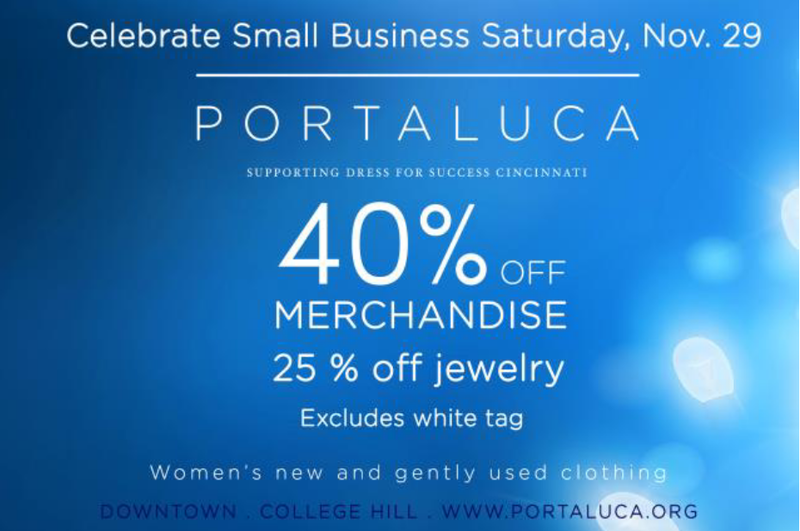 Portaluca is celebrating Small Business Saturday on November 29, by offering 40% off merchandise and 25% off jewelry! Make sure you stop in to get great deals on your staple pieces for your wardrobe!